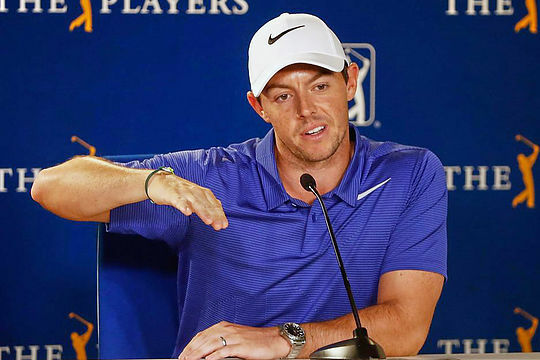 (Ponte Vedre, FL:) Rory McIlroy has returned to competition in his first event as a married man revealing he has signed a reputed deal worth $US100m with golf equipment giant, TaylorMade. McIlroy, sporting a gleaming gold ring on his finger, has not competed since sharing seventh place behind Sergio Garcia at the Masters. However, McIlroy left Augusta disappointed with his finish and is hoping to correct after signing a 10-year, 14-club deal that also includes specifically using a TaylorMade ball and bag. This deal comes after McIlroy re-signed what was believed to be a $US200m new deal with Nike clothing just prior to the Masters. McIlroy’s long-time manager, Sean O’Flaherty said the TaylorMade deal was “mongo” and it is bigger than any other TaylorMade deal including World No. 1 Dustin Johnson and also Aussie Jason Day, who is defending champion at this week’s Players Championship at Ponte Vedre in Florida. “I left Augusta very unhappy having tried many combinations this year that just were not working”, said McIlroy. And while life is very rosy for McIlroy, he also said that all is well between Garcia and Padraig Harrington as McIlroy revealed an image on his mobile he had taken at his own wedding of Garcia tucking his head into Harrington’s neck providing further evidence, if you needed it, the duo has made up. “Now this is not for anyone to take a photo but this should answer any issues that Padraig and Sergio may have,” said McIlroy smiling. The PGA Tour was also celebrating with the announcement that FedEx have agreed to extend their involvement in the FedExCup Series a further 10 years. And McIlroy, as the reigning FedExCup champion, was presented with his own bobble head with the FedExCup trophy.